Pakistan equity market again closed in red zone Thursday by 163 points at 38,385 levels. Double digit discount rate and lack of positive triggers continued to dampen investors’ confidence which led the equity market to make an intra-day low of -345 points. Overall market activity remained lackluster but after the news came in of Supreme Court accepted Rs 460 billion settlement offer from Bahria Town Karachi to be paid over seven years for land it occupied in the Malir District, sharp recovery came in the steel and cement sector. 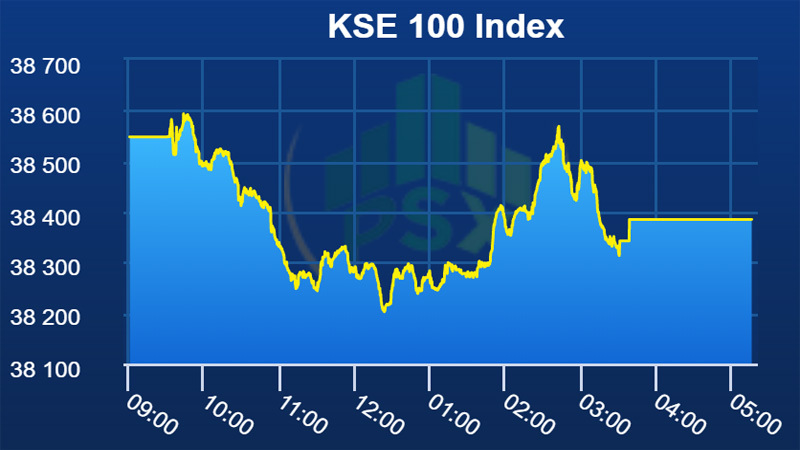 An equity analyst at Trust Securities said the benchmark KSE-100 index opened Friday’s trading session 9 points in the “green zone” and went on to make a high of 45 points taking the index to a level of 38,593, but similar to the past few trading sessions the market kept fluctuating and as the selling pressure increased the market was forced to change its position from “green” and moved into the “red” where the market went on to make a low of 345 points bringing the index down to a level of 38,202. However, as the trading session came to an end the index showed some recovery and went on to close off at a level of 38,384 (-163points) in the “”. Volume traded stood at 81 million shares as compared to 83 million in the previous trading session. Volume leaders for the day were Bank of Punjab (BOP), Pak Elektron Limited (PAEL), HUBCO, Sui Southern Gas Company Limited (SSGC), Sui Northern Gas Company (SNGP) and Oil Gas Development Company (OGDC). “We see market to remain under pressure due to lack of immediate positive triggers and possibility of rate hike in the upcoming monetary policy”, said Arhum Ghous, an equity analyst.